"Opération qui procède du simple au composé, de l'élément au tout." Posted by Andre Vellino in Information, User Interface. AppleInsider reported a few weeks ago that Steve Jobs rejected – as long as 5 years ago – the newly introduced Apple TV user interface. Predictably, Steve was right: the new UI for AppleTV has some major flaws in not just one but several dimensions: usability, cognitive modeling and information organization. Admittedly there are some problems with this way of organizing the user’s entertainment options. One is that the top level categories are not all the same kind of thing. “Internet” is a mode of delivery (which, of course, is also the mode of delivery for the rest of AppleTV content), whereas the others are descriptive of the kind of objects that are below the main menu item. What “Internet” means, clearly, is “other, non-apple applications”. 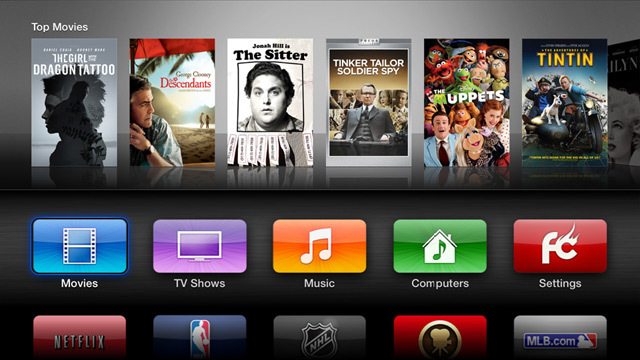 In addition, more recent AppleTV top-level menus also has the “Computer” category, meaning “Content streamed for your local computer running iTunes”, adding a second source-centered category. However, at least the old interface makes some attempt at grouping content. Furthermore, the interface for the top-level navigation resembles in structure the navigation system implemented for each of the applications. The interface has the consistency hallmark of Apple interfaces generally: learn the interface for one application and you know (more or less) how all the others behave. Contrast this with the new interface. In some respects, it is similar to the old one – thumbnails of content-images appear at the top of the screen, as expected and the content sources are more or less the same. However, the artificial segregation by source or kind is eliminated altogether: all the applications on the same footing, iPad-App style. The first serious problem starts manifesting when you scroll just one line down: the 1/2-page sized thumbnails disappear altogether. Yet the selected applications (I bet) are still generating those thumbnails – you just can’t see them any more. Right away, this gives screen real estate dominance to the first row of applications – Apple iTunes applications, naturally. Furthermore, you can’t go straight to the items in the thumbnails because you can’t see them any more. The second major flaw comes from the mixed-mode cognitive models. The first-level application-selection mode is (vaguely) iPad-like (without the ability to group apps, rearrange them or create screen-pages). However, once you’ve selected an application you’re back to the (more familiar and sensible) menu-navigation system. What’s worse, though, is that the menu system for each application is now no longer consistent. “Movies” (short for “iTunes Movie Store”) has a Mac-style top-level menu-bar rather than a right-side menu navigation bar like all the other applications. Gone is the consistent Apple look-and-feel. If at least the user had the ability to group applications as they see fit and to delete the unwanted ones (why not, the iPod/iPad allows that?). Theres just no doubt about it. Steve was right. The new UI is terrible, mainly designed to allow them to sell stuff. On a sales/marketing level, the menu system obscures choices that they want you to take, this puts them up front.